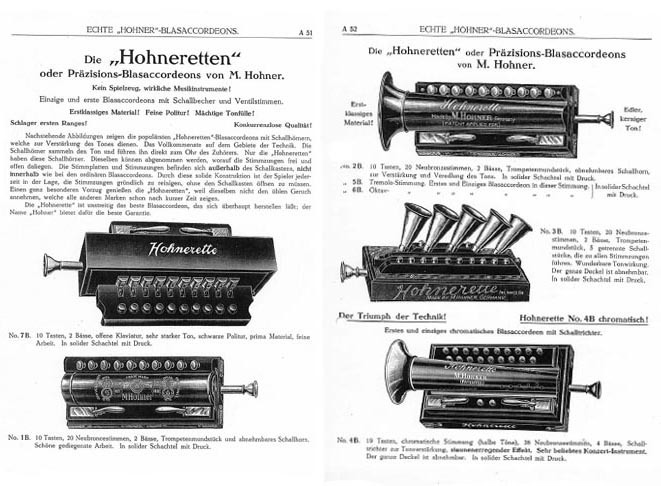 The Hohnerette was a blow accordion patented by Hohner in both Germany and the US in 1908. It was produced in several versions between 1907 and 1930. The 1B had ten buttons, each with a blow and a draw note tuned like a typical one rw diatonic accordion, with a pair of bass/chord keys giving the tonic and dominant. The 2B is essentially the same as the 1B, but with the addition of large brass horn. It was certainly eye-catching, but the horn actually had very little effect on the sound. The 3B was even more visually impressive, having five brass horns. The 4B had a single brass horn, but was chromatic with 19 melody buttons, as well two bass keys and two additional bass buttons. The 5B and 6B were similar to the 2B, except that each button sounded a pair of blow reeds or a pair of draw reeds. The 5B was tremolo tuned, the 6B was octave tuned. The 4B, 5B and 6B seem to have been less popular than the other models. The 7B is essentially a German style diatonic accordion with the bellows removed, giving it a vertical construction in contrast to the other models. Like the 1B, it had ten buttons, each with a blow and a draw note and with a pair of bass/chord keys giving the tonic and dominant.